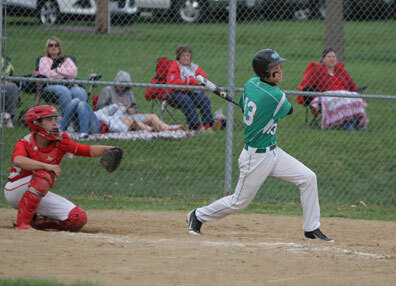 Ross Seitter(8) and Kyle Ruediger(13) score off a one out double from Garrett Schonefeld in top of the third inning. NEW HAVEN, Mo. - Garrett Schoenfeld brought the heat against St. Clair during his outing. St. Clair managed just two hits off of Schoenfeld, who allowed no runs, thanks to a solid effort on the part of New Haven’s defense, which had been inconsistent in the teams six previous losses. Ross Seitter sparked a four-run third inning with a single to center field, scoring two runs and 2-0 lead. Schoenfeld would help his on cause with a one out double, batting in two more runs as New Haven lead 4-0. Schonefeld would retire the next four batters before he would have to come out of the game after injuring his throwing arm in the top half of the fifth. While New Haven as a team has struggled at the plate, Kyle Ruediger has been hot as of late, going 6-8 in the last three games with two doubles and a triple to bring his season average up from .304 to .419. Seitter took the mound in relief for Schonefeld, giving up one unearned run (4-1) before Kyle Ruediger led off the bottom of the fifth with a triple. Ruediger would score off a Tyler Stroble groundout to shortstop, putting New Haven back on top by four, 5-1. Stroble’s RBI proved to be pivotal after a wild seventh inning. St. Clair would score three runs (5-4) and with two outs and the bases loaded, Seitter got out of the jam, forcing a fly out to center field to end the game. 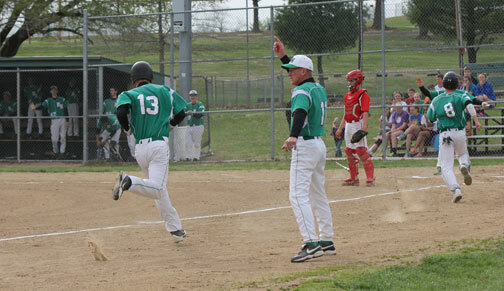 The Shamrocks snap a six game skid in Thursday’s 5-4 conference win over St. Clair, improving to 3-9 on the season. Officially Schonefeld gets the win with help from Seitter who entered the game in a non-save situation. 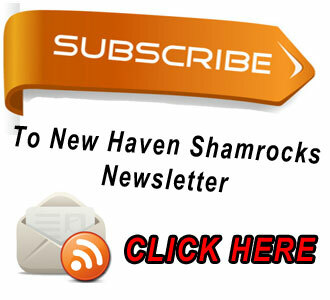 Easily following Shamrock Baseball in the Sports Zone through our Live Score Board, see up coming games, past game results, or sign up for a free GameChanger account where you can request to follow your favorite player and get free email and/or Text Message with game results.